Suman Jayadev, MD, holds an outpatient neurogenetics clinic serving patients with Huntington disease, spinocerebellar ataxias, muscular dystrophies, Charcot Marie Tooth disease, familial Alzheimer's disease-type dementia and frontotemporal degeneration (FTD), and other inherited neurodegenerative diseases. In addition to her neurogenetics clinic at UW, she also sees patients at the UW Muscular Dystrophy Association and the Memory and Wellness clinic at Harborview Hospital. In the lab, her team uses mouse and cell models to investigate the mechanisms by which familial Alzheimer’s Disease (FAD) mutations in the presenilin genes cause Alzheimer's disease pathology. 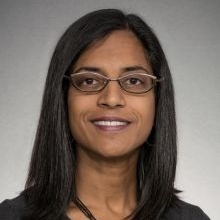 As a key researcher of the Therapeutic Pipeline Project, Dr. Jayadev is working to set best practices for genetic counseling in the future precision medicine era, when clinicians need to interpret results of whole exome sequencing for patients and families affected by neurodegenerative diseases. Researchers and clinicans often don’t yet have enough information to talk about what the test results really means to a family—the likelihood of the variant ever causing disease in a patient’s relatives, the expected age-at-onset, or the exact nature of symptoms. She also leads several clinical trials at the UW: DIAN-tu and Biogen EMERGE. Neurogenetics and neurodegenerative disease; Research Interests: Neuroinflammation and neurodegeneration.